The next show will air on Sunday November 18, 2012 from 11:00pm – 1:00am Monday on WBAI, 99.5 FM in the NYC metro area or streaming online at wbai.org. On Sunday, November 18, “Suga’ In My Bowl” will celebrate Jazz legend Pharoah Sanders’ run at Birdland this week by offering the program that originally aired on April 20, 2010. Join Joyce Jones and Hank Williams as they spend time with this marvel in the music. Pharoah Sanders possesses one of the most distinctive tenor saxophone sounds in jazz. Harmonically rich and heavy with overtones, Sanders’ sound can be as raw and abrasive as it is possible for a saxophonist to produce. Yet, Sanders is highly regarded to the point of reverence by a great many jazz fans. Although he made his name with expressionistic, nearly anarchic free jazz in John Coltrane’s late ensembles of the mid-’60s, Sanders’ later music is guided by more graceful concerns. The hallmarks of Sanders’ playing at that time were naked aggression and unrestrained passion. In the years after Coltrane’s death, however, Sanders explored other, somewhat gentler and perhaps more cerebral avenues — without, it should be added, sacrificing any of the intensity that defined his work as an apprentice to Coltrane. 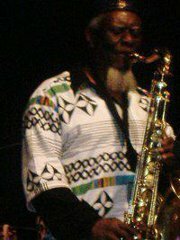 Pharoah Sanders (his given name, Ferrell Sanders) was born into a musical family. Sanders’ first instrument was the clarinet, but he switched to tenor sax as a high school student, under the influence of his band director, Jimmy Cannon. Cannon also exposed Sanders to jazz for the first time. Sanders’ early favorites included Harold Land, James Moody, Sonny Rollins, Charlie Parker, and John Coltrane. As a teenager, he played blues gigs for ten and 15 dollars a night around Little Rock, backing such blues greats as Bobby “Blue” Bland and Junior Parker. After high school, Sanders moved to Oakland, CA, where he lived with relatives. He attended Oakland Junior College, studying art and music. Known in the San Francisco Bay Area as “Little Rock,” Sanders soon began playing bebop, rhythm & blues, and free jazz with many of the region’s finest musicians, including fellow saxophonists Dewey Redman and Sonny Simmons, as well as pianist Ed Kelly and drummer Smiley Winters. In 1961, Sanders moved to New York, where he struggled. Unable to make a living with his music, Sanders took to pawning his horn, working non-musical jobs, and sometimes sleeping on the subway. During this period he played with a number of free jazz luminaries, including Sun Ra, Don Cherry, and Billy Higgins. Sanders formed his first group in 1963, with pianist John Hicks (with whom he would continue to play off-and-on into the ’90s), bassist Wilbur Ware, and drummer Higgins. The group played an engagement at New York’s Village Gate. A member of the audience was John Coltrane, who apparently liked what he heard. In late 1964, Coltrane asked Sanders to sit in with his band. By the next year, Sanders was playing regularly with the Coltrane group, although he was never made an official member of the band. Coltrane’s ensembles with Sanders were some of the most controversial in the history of jazz. Their music, as represented by the group’s recordings — Om, Live at the Village Vanguard Again, and Live in Seattle among them — represents a near total desertion of traditional jazz concepts, like swing and functional harmony, in favor of a teeming, irregularly structured, organic mixture of sound for sound’s sake. Strength was a necessity in that band, and as Coltrane realized, Sanders had it in abundance. Sanders made his first record as a leader in 1964 for the ESP label. After John Coltrane’s death in 1967, Sanders worked briefly with his widow, Alice Coltrane. From the late ’60s, he worked primarily as a leader of his own ensembles. From 1966-1971, Sanders released several albums on Impulse, including Tauhid (1966), Karma (1969), Black Unity (1971), and Thembi (1971). In the mid-’70s, Sanders recorded his most commercial effort, Love Will Find a Way (Arista, 1977); it turned out to be a brief detour. From the late ’70s until 1987, he recorded for the small independent label Theresa. From 1987, Sanders recorded for the Evidence and Timeless labels. The former bought Theresa records in 1991 and subsequently re-released Sanders’ output for that company. In 1995, Sanders made his first major-label album in many years, Message From Home (produced by Bill Laswell for Verve). The two followed that one up in 1999 with Save Our Children. In 2000, Sanders released Spirits — a multi-ethnic live suite with Hamid Drake and Adam Rudolph. In the decades after his first recordings with Coltrane, Sanders developed into a more well-rounded artist, capable of playing convincingly in a variety of contexts, from free to mainstream. Some of his best work is his most accessible. As a mature artist, Sanders discovered a hard-edged lyricism that has served him well. Bio from Chris Kelsey, All Music Guide. Show hosted and produced by Joyce Jones and Hank Williams. Engineered by Joyce Jones.